Open dawn to dusk daily, mid-April through early November or first snow. 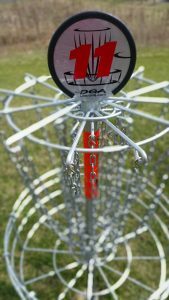 Disc golf is played much like traditional golf. Instead of a ball and clubs, players use a flying disc or frisbee. The disc/frisbee is thrown from a tee to a basket, which is the "hole". As a player progresses down the fairway, he or she must make each consecutive shot from the spot where the previous throw landed. Finally, the "putt" lands in the basket and the hole is completed. The object is to throw the disc/frisbee from the tee area to the target "basket" in the fewest number of throws. Must start play on one hole. 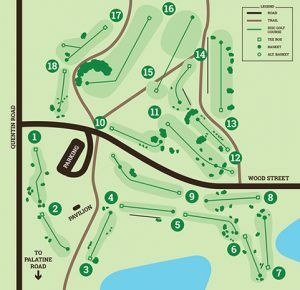 Players must tee off from the designated tee area. Be sure the players in front of you, and other park users are out of range. When playing a hole, the player farthest away from the basket throws first. The hole is complete when a players disc lands in the basket or chains. The player with the least number of throws on the last hole tees off first on the next hole. The spot where your previous throw has landed is called the "lie". To begin your next throw, your lead foot must be on or within 11 inches directly behind the lie. The other foot may be no closer to the hole then the lie. A run-up and natural follow through after release is allowed. Any disc that comes to rest above the ground (in a tree or bush) is considered an unplayable lie. The disc must be thrown from the lie on the ground directly beneath the unplayable lie (one stroke penalty).